¿Cómo la participación del público ayuda a MinD? Participants from the University of Wolverhampton (UK), Technical University Dresden (DE), Panton Design Agency (NL), and new partner Etic Lab (UK), were hosted by Picharchitects (Pic) and Universitat Politècnica de Catalunya (UPC), both based in Barcelona. During this visit, the MinD team (together with our hosts) worked on the design development of the two design ideas selected with the help of people with dementia and healthcare experts in October 2017: The ‘Good Life Kit’ and the ‘Social Engagement Map’. The ‘Good Life Kit’ will help people with dementia to deal with their condition constructively and openly, especially at the point of the diagnosis when there can be a feeling of loss and uncertainty about the future. The ‘Social Engagement Map’ aims to help people with dementia stay socially connected and engaged. It responds to findings that elderly people in general have fewer social connections, and that people with dementia in particular may find it difficult to maintain or establish social connections. Continuing on from work completed in December 2017, the team now worked on refining the details of the concepts and also started with work on their realization, including on the visualization, interaction and programming of the digital and physical parts. The designs are envisaged as a combination of physical and digital design solutions to make them user-friendly, easy and intuitive to use. The feedback from the latest PPI session earlier in March in the UK provided vital feedback to help further develop these ideas in the new year to make the designs fit for purpose. The team worked in two separate groups on the two design ideas, but met in regular intervals to discuss their ideas and progress. During the design work, designers, technologists and psychologists from the MinD team worked together to develop the format and content for the different parts of the designs. The team created visual examples and models to discuss how the designs will look, how they will work, and when and how they can be used. 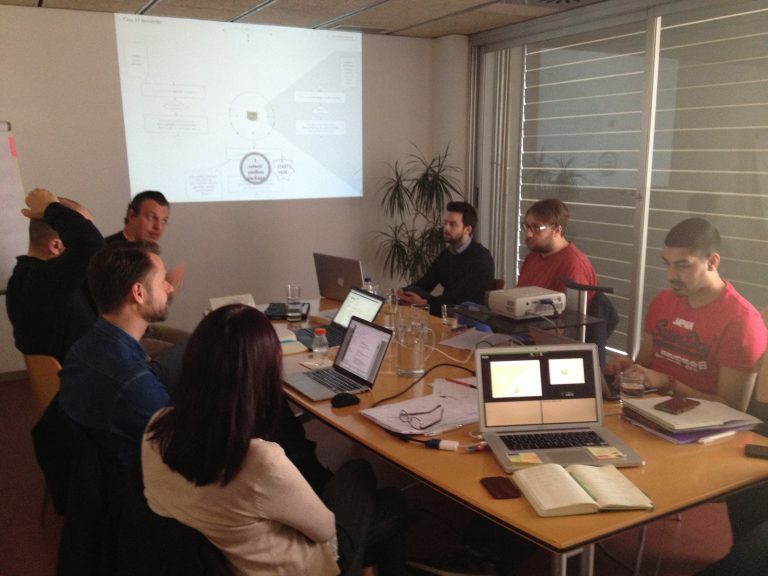 Colleagues from UPC shared design project solutions, such as CaregiverPro, from their own related projects with MinD team colleagues by way of mutual support and knowledge exchange. This project has received funding from the European Union’s Horizon 2020 research and innovation programme under the Marie Skłodowska-Curie grant agreement No 691001. This website reflects only the authors' view and the Research Executive Agency is not responsible for any use that may be made of the information it contains.